Royal moment for Henshaws - Pictured with Princess Diana in 1989 are Steve Jones, the then Principal and Mrs Lawrence, the then Chair of the Board. Princess Diana once visited it and it’s got its own triathlon team, Henshaws charity may be a familiar name locally but how many people know the full range of what it does or what its own story is? Or that this Harrogate and Knaresborough-based charity for the blind and other people with disabilities has a lengthy and distinguished history? 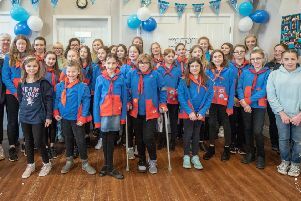 The charity which supports people living with sight loss and a range of other disabilities to go beyond expectations is bigger and has been going longer than readers may have thought. Founded in 1837, Henshaws is 180-years-old. Its original base is Manchester but, during the 1960s, it was demolished to make way for new office buildings. So in 1971 Henshaws reopened at its current site on Bogs Lane in Harrogate, which is where its Specialist College still stands today. As times have changed, so has its name. In 1921, it was Henshaw’s Institution for the Blind, in January 1971 it changed to Henshaw’s Society for the Blind, and in 2000 it became Henshaws Society for Blind People. Henshaws employs 360 members of staff of which 292 work in Yorkshire. In total 80% of those employed in Yorkshire live in the Harrogate or Knaresborough post code area. Through its Arts and Crafts Centre at Bond End in Knaresborough where students can develop and exhibit their skills, Henshaws has become a hub for creative events. If there’s one priority this charity strives to achieve above all else, it’s helping people living with sight loss or other disabilities be more independent. Henshaws works closely with North Yorkshire County Council to provide Supported Housing in Harrogate vital to empower disabled individuals to live more independent lives. James, Seb and Scott are a group of young friends in their 20s who now live together happily in one of the Henshaws houses. Princess Diana visited Henshaws College on February 28, 1989 to meet staff and students. Princess Anne visited Henshaws College in 1992. Maggie Pattison, who has worked at Henshaws for more than 30 years in Housing & Support and us as head of student wellbeing in the college, said: “There’s something about Henshaws that gets in your blood. Henshaws College student Mike Davitt, who has cerebral palsy, always wanted to be able to stand on his own and have a pint with his dad. For Mike’s 21st birthday he stood at the bar and ordered a drink after being helped to learn to walk for the very first time while at Henshaws Specialist College. Henshaws staff & students have their own triathlon team! Team Henshaws are well-known at the Skipton Triathlon but took part in their first ever international triathlon this year at the Colombia Threadneedle World Leeds Triathlon, a global event. John Haithwaite, uses the facilities at the arts and crafts centre, and is one of the newest recruits to the triathlon team. The Arts and Crafts Centre was built on the site of the old Knaresborough zoo and animals continue to inspire a lot of the artwork produced on site. The Arts and Crafts Centre first opened to the general public on April 25, 1999 after receiving a £1.8m grant from the National Lottery through the Arts Council of England. Every week, the centre support over 150 art makers aged from 17 to 80-year-old with a wide range of disabilities and complex needs. The Arts and Crafts Centre involving students, staff and the local community with facilities for visitors including a café, exhibition gallery and shop. It hosts monthly live gigs with local rock bands and singer-songwriters under the title Friday Night Mix and is a major venue for the whole town during Knaresborough’s annual feva arts festival. Last year 40% of Henshaws graduates progressed to work- based activity . Accommodations for blind and partially sighted persons in need of residential care. Employment for blind and partially sighted persons. Education for blind and partially sighted young persons. Vocational training for blind and partially sighted persons. Henshaws is dependent on financial support from local individuals and organisations and is always very grateful to receive it. Henshaws fundraising team recently visited Harrogate law firm Raworths with one of their students to receive a donation. In 1993 Betty’s and Taylors of Harrogate were particularly generous, raising £16,000 for Henshaws. As well as Henshaws’ student graduation ceremony each year, this year saw the launch of the Henshaws awards celebrating outstanding achievement. The centre piece was the Gillian Lawrence award which went this year to Matthew Briggs who had displayed incredible determination to overcome a lifechanging illness and operation which he did and is now back at Henshaws.